First there was the big bang, a explosion that created the universe, and the nebula which is a cloud of dust and gas. Over billions of years, gravity pulled the nebula into very dense balls; at this point the gas was so dense that the gases are actually creating nuclear fusion! More gases were compressed together and finally made what we have today, the sun. The sun is a giant ball of burning gas. Most of the gas is hydrogen, about 70 percent, helium, carbon, nitrogen, and oxygen makes up the other 30 percent. Elements like iron, neon and sulfur are also in the sun. First we have the corona, which is the outer atmosphere of the sun, which is even bigger than the sun itself! 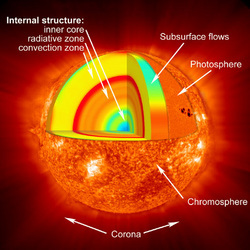 The corona merges smoothly with the solar wind to fill the solar system. Then we have the chromospheres, the layer above the visible surface of the sun that is about 2,000 km thick. The chromospheres is visible as a colored flash at the beginning and end of eclipses of the sun. Underneath that is the photosphere, surface of the sun. 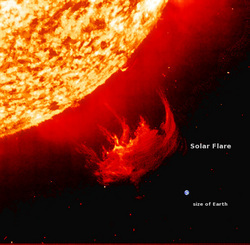 This is where sunlight escapes from the sun and into space, the heat now is about 6,000 k.
Then is the convection zone, a layer that circle around the center and other layers, is where the energy is transported by radiation out in space. As soon as the energy cools at the surface, it descends, forming a cycle. The Radiation Zone is where the nuclear energy in the core is generated and moves outwards as converted by photons, or tiny particles that makes up light. 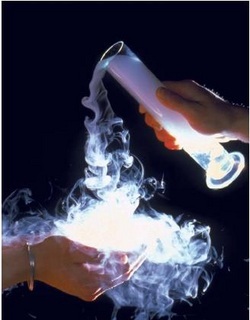 In the most inner sector, is the core, it is made up of really hot and dense gases with the temperature of 27 million F! The core is where the energy of the sun is made, the density and temperature is just right for nuclear fusion to take place. In about 5 billion years the hydrogen in the center of the sun will start to run out, which causes the helium to become squeezed and will speed up the burning. It will slowly puff into a red giant and it will eat all of the inner planets, even Earth. The sun's energy makes life on earth possible. The sun is the main source of energy for the life on earth, such as without the sun mankind could not have exist, the plant could have wiethered.Especially the solar output that change our climate and control our future. Sun spots are dark, planet sized regions on the surface of the sun in the color of a black spot. They are dark because they are colder than the areas around them, with an average temperature of 3,700C- 5,500C. Sun spots are only dark in contrast to the rest of the sun. The powerful magnetic field, welling up to the photosphere are the creators of black spots. It is a stream of charged particles, mostly electrons and protons flowing outward from the sun and through the space at 900 km/s and at a temperature of 1 million degrees C. The solar winds are caused by the hot solar corona. 2. 109 earths would fit across the sun’s disk, and 1.3 million earth would fit in the interior of the sun. 3. The sun’s energy output is almost 386 billion megawatts per second!!! !